I was using mineral makeup about a year ago. In that time, I ran the gamut of all sorts of brands of mineral foundation. However, for brushes I zeroed in straight on the Lumiere Kabuki brush, no second thoughts. I’d read so many good things about the kabuki I knew I’d have to order it. This review is for the benefit of those who are still using mineral foundation and want a good kabuki brush that can buff in the foundation for a flawless finish. You need look no further than the Kabuki from Lumiere Cosmetics. For some strange reason its not available at their online store – perhaps they are restocking. Mine is the full size Kabuki which isn’t all that big as you can see above. Just a little shorter than a Dior lipstick. The synthetic bristles are so wonderfully soft and pliable and its packed very densely – all the better to buff in the foundation. I found that because it was so dense it worked very well for applying a light layer of mineral foundation over your skin and for buffing. Your skin never gets scratched by the brush because its so soft! Do you see the recurring exclamations of “soft!”? Its because it is! However I no longer use mineral makeup so my Lumiere Kabuki brush got placed by the wayside. Until recently when I was looking for my powder brush that had slipped behind my dresser – ew! At a bit of a loss, I decided to try using the Lumiere Kabuki brush. Know what? It works just the same with normal 2-way powder foundation as it does with mineral foundation! I don’t end up picking as up as much color on the brush as I do with normal powder brushes and I found that it gives a smoother (sheerer) coverage than when I use a sponge but slightly heavier coverage than with a normal powder brush if that makes sense. Thankfully I worked this out or this brush would be sorely underused! Why is it called a Kabuki Brush? I used to wonder why a kabuki brush is called that. I know what Kabuki is – its a form of traditional Japanese theatre, rather like the Chinese Opera, where the actors paint their faces white and makeup must be strong to stand out from the stage. PREVIOUS POST: Whats your favourite shoe brand? NEXT POST: 12 Yuan Soap winners! I’ll report once I know that Loving Minerals is carrying it. OMG!!! I wanted to try Lumiere’s brushes! Too bad their pre-buy’s were no more. I hope that I can keep an eye on their pre-buy’s brushes coz they are so worth it! I have this too! Currently am using EDM’s kabuki and even that can’t compare with Lumiere’s as it has a much smaller ‘head’ and feels less dense. LOL… I read your mind over the seas! 😀 I was curious too and I’m glad it answered a question or two! Yay, will want to check this out. Am currently using a Body Shop Kabuki for my 2 way foundation and it’s working out well. But I have no other comparison as that’s my first kabuki. I did not try the one from the Body Shop but I hear its pretty good too! Will have to try this. Am using EDM’s kabuki and it’s already dense and soft soft soft. If the Lumiere one is even softer…. woooooo…… I must get my hands on it. I’m not sure if this Lumiere one is considered a bargain in terms of price but it surely is in terms of quality! I use their eye pigments as a concealer. Rested[matte yellow], and willow[matte light green]. Conceals my breakouts well! Haha! plus it’s talc free. Thats a nice use of eyeshadow! I got the synthetic kabuki brush from Coastal Scents. Its what I do too! Thank you for the review 😀 And that little history snip on Kabuki! I use my kabuki for loose powder and an overall buffer to make sure everything on my face look blended. Oho! I shall consider my Kabuki for loose powder too! Thanks for the tip! 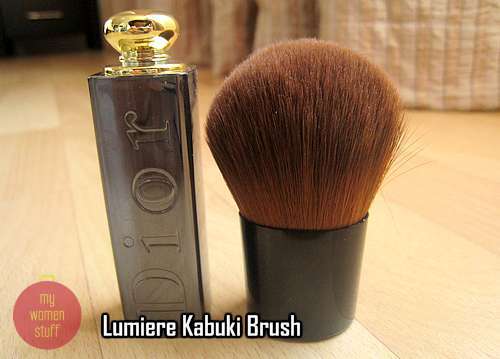 mineral makeup was not really my thing, but i have heard this lumiere kabuki brush before! hope it will available at loving mineral soon! thanks for the post. just wondering why you stop using mineral makeup?